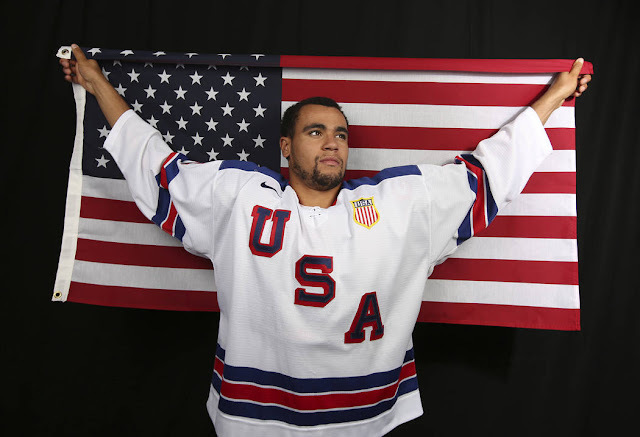 Jordan Greenway, a junior forward at Boston University, became the first African-American named to the U.S. Olympic men’s hockey team when the final roster was announced last week. Greenway is set to break a 98-year-old color barrier that lasted 23 Olympic cycles. Greenway was a second-round pick (No. 50 overall) by Minnesota in 2015 and could have signed with the Wild in the offseason. Instead, he returned to Boston University with hopes of making the Olympic team. The 20-year-old from Canton, New York, is the second-youngest player on the U.S. team, which is comprised primarily of players from the American Hockey League and European leagues. Greenway is one of four college players. The 6-foot-6-inch, 227-pound Greenway has seven goals and 17 points in 19 games this season with Boston University. He finished with eight points (three goals, five assists) and helped the U.S. capture the gold medal at last year’s World Junior Championship.